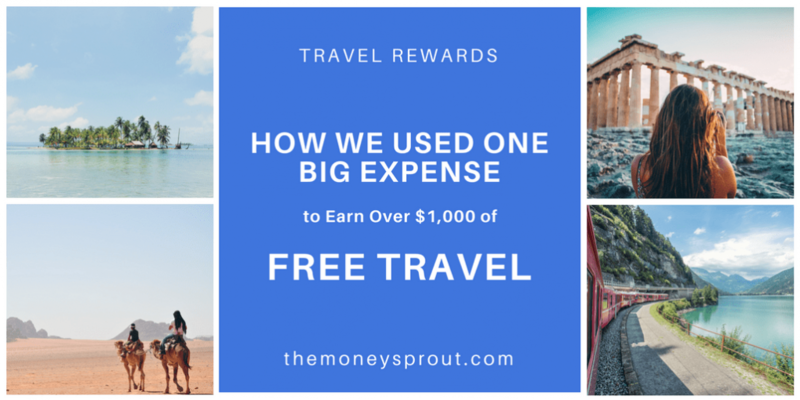 Last fall (about 6 months ago), I opened up our first travel rewards card. 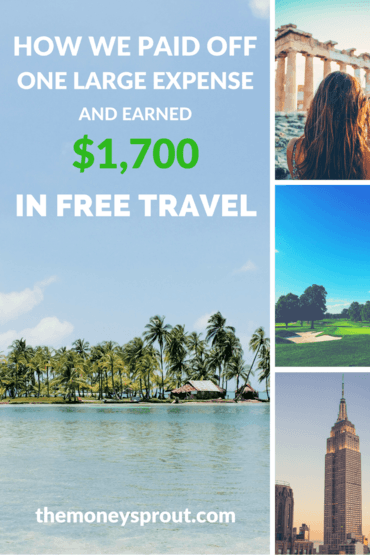 After reading stories of people earning thousands and thousands of dollars in free travel … my wife and I were hooked. That first card earned us over $500 in free travel, so we decided to open up 3 additional cards over the next couple of months. We have now finished up hitting our minimum spending requirements on each of the cards and have built up over $3,000 in future free travel. Our goal is to one day take our family of 5 to Hawaii for Free! Building up our portfolio of rewards points and travel miles should help our family reach this goal. Here is a recap of our 4th travel rewards card. We took advantage of one big expense we had to pay in order to hit our spending requirements on this card. We recently finished up our minimum spending requirement on card #4, which is the Chase Ink Business PreferredSM in my wife’s name. This latest card has a minimum spend of $5,000 in the first 90 days to earn 80,000 bonus points. I was able to hit the $5,000 in spend a few months ago on this same card by paying for most of our property taxes at the end of 2017. We also had some furnace repair and a bit of travel expenses that pushed us well over the minimum spend limit on that card. Another added bonus on my card, was the extra 20,000 points I earned by referring my wife … which was a nice added bonus! Well, my wife recently met her minimum spend requirements for the same card and was rewarded the 80,000 bonus points just a few days ago! How Did We Use Card #4? We hit our $5,000 minimum spending target exactly 60 days after signing up for the card. Our strategy for this card was very simple. Use it to pay for our son’s braces and then loan our-self the money to cover the credit card bill. Since his total cost to get braces was over $6K, it was a great opportunity to optimize our spending and get a bit of FREE Travel out of it. What we didn’t realize at the time though was my wife’s credit limit on the card was $5,000 … so we couldn’t pay the entire bill off. So we split the payment up between 2 of our cards. A total of $4,000 was charged to this card, while the balance was charged to another travel rewards card. Because of the high expense for braces, this was the easiest card to date to hit our minimum spending requirements. And by loaning ourselves back the money to cover the costs, we were able to save $1,068 … which is the equivalent of a monthly mortgage payment. Our expenses went over the minimum spend on this card by only $30. We did a much better job of optimizing our spending this time around, compared to my Chase Ink card a few months back where I went over by $2,000. We were able to quickly reach our minimum spend on this card within the first 90 days, and were rewarded our 80,000 bonus points! With the extra points from spending, we earned just over 85,000 Ultimate Rewards® points from this card. Here is a recap of the points we have earned on card #4 on our travel rewards journey. We spent just over $5,000 on our card in about 60 days, which gave us 5,030 points for spending. No extra bonus points for travel expenses were earned this time around on our Chase Ink card. The remainder of the points were from the awesome 80,000 point bonus for hitting our minimum spend! That is the reason for opening this card in the first place. Note – All points listed above are Ultimate Rewards®. At a minimum, these 85,030 points are worth $850.30 if redeemed for cash (or $0.01 a point). That is a nice chunk of money for making our normal purchases. Since we plan on using them for travel, they should be worth more … maybe even up to $0.02 per point. That type of redemption would put the value at $1,700 or more. Eventually when we redeem these points, we will cover the value they return on our travel. Note – I would like to point out that the true cost of these points would actually be $95. The annual fee for the card ($95) was not a normal expense and did not count towards our minimum spend. We would not have made this payment with our normal spending. Overall, I would say that $95 in extra spending is worth it. Since we already paid the $95 annual fee on this business card, we will keep it open for a while. This will give us a chance to figure out where to keep all of our Ultimate Rewards® points. Just to get everyone caught up, so far since last August (2017), my wife and I have earned over 316,000 Ultimate Rewards® points combined. We have both earned our 50,000 bonus points each for the Chase Sapphire Preferred® and 80,000 bonus points each for the Chase Ink Business PreferredSM. Add in a few referral bonuses and regular spending and we are over 316,000 points! Eventually, we would like to figure out a way to combine all these points, but are not sure the best account to do that yet. We have a few months to figure this out before the annual fee kicks in on our first Sapphire card. The awesome news is that all these points will be worth at least $3,160 if we just redeemed them for a penny each! That is enough to make almost 3 mortgage payments which is so cool. Even if we never use them for travel (which we still plan to do) … that is an incredible return for travel rewards. We haven’t spent any extra money than we normally would have … except for about $291 in annual fee’s and transaction costs. Now that we have built up a great balance of Ultimate Rewards® points, we are going to switch our focus to a few other cards. I would say between these 3 cards, we won’t open any new cards until late summer or the fall. Next on the list (card #8) would likely be something for my wife. Much more to come in the future about cards #5, #6, and #7 in future posts. To follow our journey of earning free travel, check out our Travel Rewards page. Are you building your travel rewards portfolio? Would love to hear your comments and experience!